With Day 1 complete and some 60 km ridden with around 1500m of climbing under our belts it was onto Day 2. 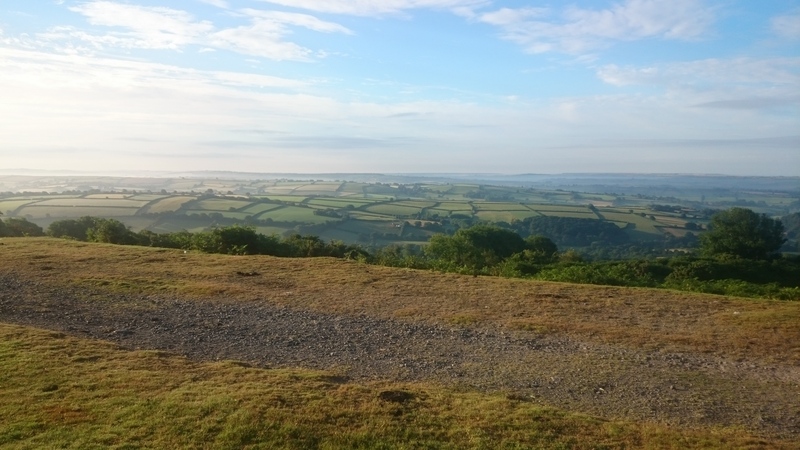 There were plenty of new trails to be ridden on this 2nd day along a new route that would take us to a tried and tested camping ground just north of Ivybridge. Day 2 started with a good hearty and healthy breakfast. Well, after packing up camp and hurtling down the hill off the moor and into Tavistock that is! My 3-day bike camping treks always include camping close to a suitable small town, that way we don’t have to carry as many supplies and we can indulge in a cafe breakfast and a takeaway dinner. Breakfast like last year was eaten at The Original Pasty House; but this time from their new ‘Breakfast Menu’ which provided me with a great bowl of porridge alongside a plate of scrambled eggs on toasted English Muffin. With breakfast out of the way Phil and I bought a pasty each to take away for lunch before we headed off to Tesco to pick up water for the day and some other bits and pieces. Then it was back up into the moors to continue the mountain biking and enjoy the trails. 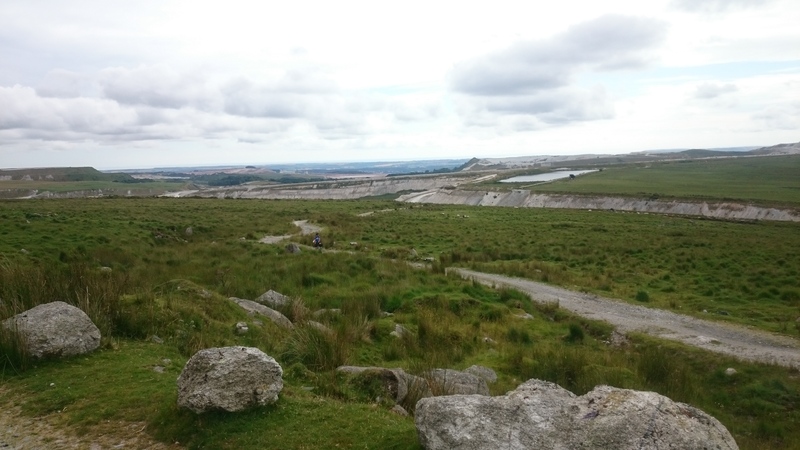 We began on the same route as last year’s Day 2, taking the fun rocky bridleway out of Merrivale and onward toward Princetown via the old rail tracks. These tracks make for easy riding and used to be part of the Princetown to Yelverton line, until 1956 that is! Last year between Princetown and Ivybridge we took the bridleway out from behind The Plume of Feather’s Inn as far as Whiteworks and then tried to cross the moor from there directly to Ivybridge. And we did actually succeed, albeit with a lot of pushing, some carrying, lifting and dragging and almost no riding of our bikes. Basically the marked bridleway on the maps didn’t equate to any sort of trail at all in reality. So this time the plan was to turn off after South Hessary Torr to Burrator Reservoir and then skirt around the Quarry at Lee Moor to arrive in Ivybridge. And having taken a more direct route to Princetown this time we were slightly further ahead of schedule so we reached South Hessary Torr in time for lunch and photo opportunities. Well, if last year’s route was massively disappointing, then this year’s route was the complete opposite; diametrically opposed, if you prefer. From Princetown all the way down to Burrator Reservoir was fantastic, rocky and fast most of the way; although we did have to slow to pass some squaddies out on manoeuvres at one point. Then the bridleway around Sheep’s Torr although a bit muddy in places culminated in a brilliant technical descent to the road. And finally the long descent from the quarry through Newpark Waste to Newpark Wood was ultra fast; a real ‘how fast do you dare’ sort of descent. The only concerning bit for me was whether or not we’d be able to ride all of the way around the quarry, both in terms of able and allowed. It starts off as a road and the sign says dead end, but then I knew that the road ended at a car park, so this wasn’t a surprise. Then all the time we rode along, we were constantly reminded by signs at regular intervals that there was ‘no admittance’ to the quarry itself. Also on the OS maps the initial road becomes a bridleway and then it becomes a marked tracked but with no reference to right of way and then there is a bridleway marked out the other side but not really connected to the marked track. I had also searched on Google and found no reference to others having ridden around here or in fact any right of way information. So would we ride so far and find we could go no further? Would we reach the end of the track and find that the bridleway starts 20 ft below us at the bottom of a cliff edge? These are questions that can only be answered now after the event and I can confidently say; we got all the way around successfully! Part of it is permissive bridleway though so if the quarry decide to close that section then they can. Also at the end of the track you do have to turn to your right and cross a bit of grassy ‘no man’s land’ to reach the bridleway lower down. This time I feel Day 2 was a definite success. One of the reasons I wanted to return to Dartmoor for a second adventure, rather than go elsewhere. We arrived into Ivybridge ready for food and although Fish and Chips were once again available we all turned our attentions toward the Pizza place. Two meat feasts and a Hawaiian (missing it’s Ham, whoops) later and we headed off to the pub for a couple of pints as we were a bit early for setting up camp. We also found out that beer gardens aren’t exactly a specialty in Ivybridge, in fact a bench in the car park of The Sportsmans Inn was the best that we could muster. The Devon Dumpling from Bay’s Brewery, Paignton went down a treat anyway though. Then we just had the small task of 3.5 km and 177 m of climbing to where we would set up camp. Again, another great camping spot. Well sheltered, level and with an awesome view. The second night of camping went just as well as the first, no rain, no issues, good sleep. Day 3 promised some more untried bridleways and a fair few hills and that will come in the next installment, so keep your eyes open for that.